SANZAR has got something right. Southern Hemisphere rugby's ruling body has copped criticism from all directions for scheduling confusion, judiciary inconsistencies and refereeing bungles, but they made certain the ANZAC Day round of matches were memorable and the 100th anniversary of the landing at Gallipoli was properly celebrated. 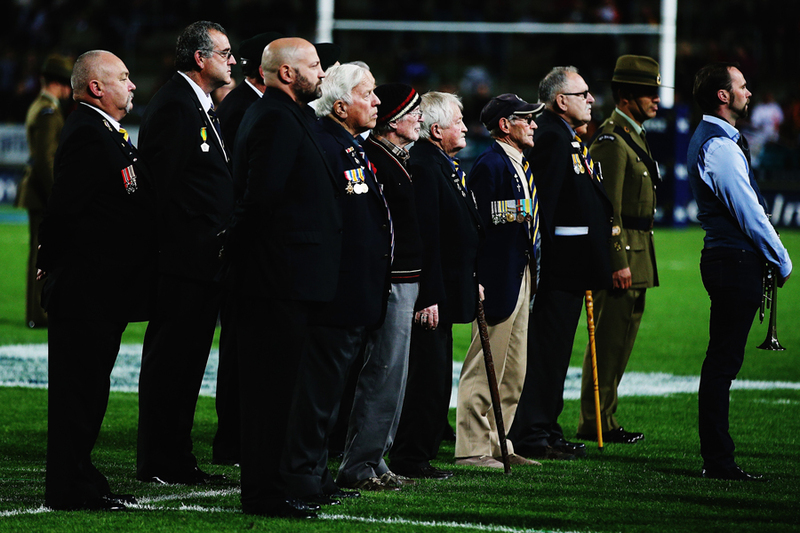 It has taken a while for SANZAR to embrace Anzac Day in the right manner. Two years ago, they let themselves down when they failed to schedule major matches for that day - unlike the AFL and NRL. Anzac Day in 2013 fell on a Thursday, but that didn't stop the AFL and NRL both staging two games. ESPN wrote at the time that SANZAR had missed a free-kick. Then last season we had the debacle in Canberra, where the Brumbies were informed they could not play the Australian and New Zealand national anthems before their Anzac Day match against the Chiefs because it contravened rules in the tournament's operation manual. Thank goodness that ridiculous rule was scrapped this year, with the national anthems played at the fixtures involving teams from either or both countries over Friday, Saturday and Sunday; each fixture became a moving occasion with The Ode, The Last Post and anthems reminding all of the ANZAC sacrifice and legacy. At each game, we observed players, officials and spectators clearly affected by the moment - and there were lovely scenes of Rebels and former All Blacks centre centre Tamati Ellison mouthing the words of the New Zealand national anthem before the match against the Waratahs. The ceremony also offered a timely reminder of Australian and New Zealand rugby's deep links with battle - which date back to the Sudan and went into overdrive during the Great War. About 90% of senior rugby players in New South Wales and Queensland, enlisted for World War I, which saw the code disbanded at district and interstate level; in World War II, Wallabies and All Blacks, plus their provincial representatives, were at many of the major battles. To coincide with the most important of Super Rugby rounds, Spiro Zavos wrote a marvelous piece for Fairfax Media suggesting how the Australian Rugby Union should create a competition to celebrate one of its most notable footballers/soldiers - Tom Richards. Richards was the star of the first Wallabies tour of Great Britain in 1908-09, an Olympic gold medalist, the only Australian-born player to represent the British Lions, landed at Gallipoli, and won a Military Cross on the Western Front. He was also a brilliant writer. His extensive and brutally honest war diaries are of such high standard, that Zavos wrote that they "rank with Albert Facey's A Fortunate Life as one of the most poignant documents of the Australian experience during the Great War". Zavos finished his article thus: "To mark the centenary of the Anzacs, the ARU should create the Tom Richards Shield for competition between the Australian Super Rugby teams. Lest we forget." I can only heartily agree with Zavos's sentiments, and hope the ARU take notice. Then again, in regards to Richards, I am very biased. Over the past 20 years, he has been a major influence in my life; hardly surprising considering that I wrote a biography on this extraordinary man, entitled Gold Mud N'Guts, in 2001, and edited his war diaries in 2013 under the title Wallaby Warrior. I was delighted that some years ago the ARU readily embraced the idea of having the Wallabies and British & Irish Lions play for the Tom Richards Cup. The next step for the current vastly different ARU regime is to agree upon the Tom Richards Shield having shown a sense of history by producing an impressive and comprehensive Anzac gallery. On this Anzac Day, as with every previous one over the past decade, I carried with me some Tom Richards mementos - including a small personal notebook he had with him for most of his life, including during the Great War. 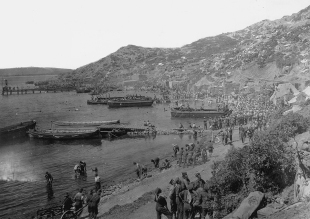 "April 3 Left Cairo April 8 Lemnos Harbour April 20 Made Lance Corporal April 25 Anzac Bay landing August 14 Left Anzac sick Nov 9 Anzac again Dec 12 Left Anzac"
The day involved a wreath-laying ceremony at the nearby War Memorial, birthday cake, rum ration, bowls, then a two-up game on one of our greens overlooking Sydney Harbour that would have gone on forever had an electrical storm and hail not hit just before dusk. A moment of reflection was followed by a rollicking affair as the pennies were tossed towards the heavens, with young and old celebrating everything that is good and crucial about Anzac Day. To then observe the stirring ANZAC tributes at the Sydney and Brisbane Super Rugby matches - with Suncorp Stadium even producing tanks and machine gun fire - provided a perfect ending to the most special of weekends.